Because of generous donations from individuals as well as Illinois ASBO Regional Organizations, numerous scholarships are available to help you advance your career in school business management and further develop your skills. These scholarships are an investment in the future leaders in the school industry. Look below for opportunities to grow in your chosen profession! View a list of past scholarship recipients. At the Annual Conference Closing General Session, Foundation scholarships were presented to school business professionals getting started in their career or continuing to build on their knowledge and skills. Applications are now available and are due October 15. See a list of scholarship opportunities available for those pursuing their education in school business management. This scholarship is available to facilities professionals to help toward participation in the CPS and CPMM Facilities Certification Programs. Four half-tuition scholarships are available each Leadership cohort — both for school district and Service Associate members! Illinois ASBO Service Associates provide three ASBO International Annual Meeting scholarships to qualifying school district members. Watch for details on how to apply at Illinois ASBO's Annual Conference! In addition, the Fox River Valley and DuPage Regional Organizations will be awarding scholarships to school district members to be used towards registration and travel expenses for the 2019 Annual Meeting & Expo. Support future leaders in the profession to continue their education through a donation to the Illinois ASBO Foundation! Know someone who has made an extraordinary contribution to the profession and deserves recognition? 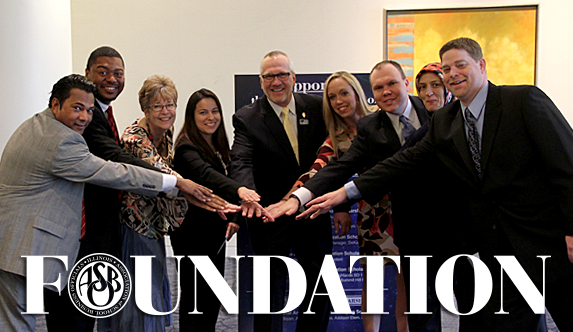 Nominate someone for a Foundation award! See a list of others who have already generously donated to the Foundation. Volunteer with fellow members and make a difference to kick off the Annual Conference.